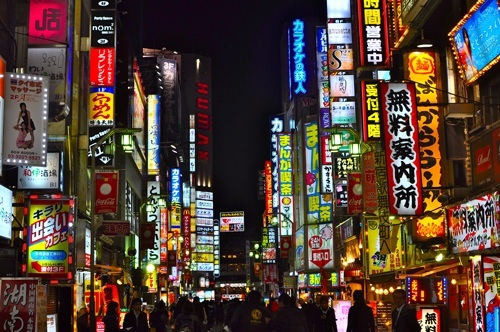 All Nippon Airways (ANA) is currently showing flights from Toronto to Tokyo, Japan for just $688 CAD roundtrip including taxes. There have been even crazier prices to Japan recently, however, it's notable how such a large range of dates are available at this price, from late August 2016 summer travel right through to spring 2017. Look for the dates that are $765 CAD. 4. 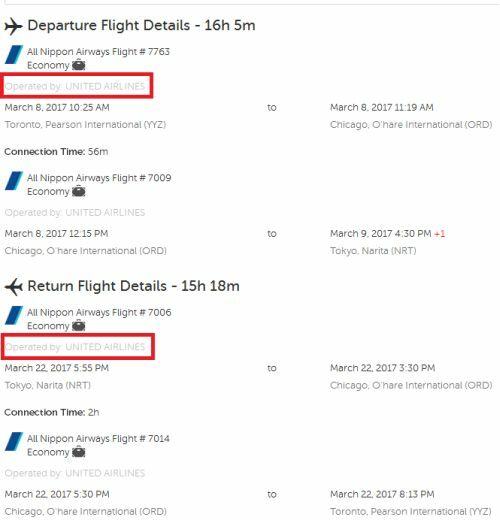 Search for a flight from Toronto (YYZ) to Tokyo (HND) using the same dates as you found above. Be sure to choose Tokyo Haneda Airport (HND) - which is the airport that's close to downtown Tokyo. If you click through to BookingXpert.ca - you may find that it doesn't work. Clicking through to FlyLink works. Once you get to Momondo.ca you may want to take the checkmark off of NRT from underneath 'Destination Airports'. That way you will only see results to HND airport. UPDATE 5/22 - You may also want to try searching on ITravel2000 who is now showing these for $682 CAD roundtrip including taxes, and is a reputable booking site. You can try starting with this direct ITravel2000 search link. Click on 'Edit Your Search' (top right) to try other dates. Try dates from your Google Flights search above. Important: When you get to the ITravel2000 search result page, you should click on 'All Nippon Airways - from $682' on the left-hand side. But you still need to click on 'Show details' below the flight, to make sure the overseas flight is not operated by United Airlines (unless that's what you want). Try looking at different departure times for the connecting flight in Chicago to find the overseas flights that are operated by All Nippon Airways. So just watch out for that. 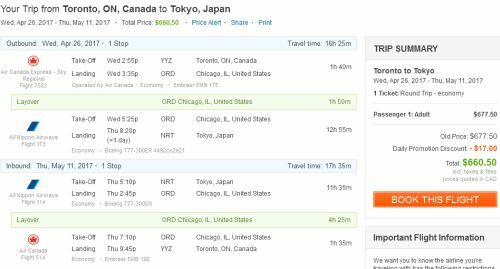 Update 5/24 @ 7:45 PM EST - The Toronto - Tokyo flights have now dropped to $601 CAD roundtrip including taxes! 2. Click on the departure date box to open up the calendar view. Browse for cheap flights between August 2016 and March 2017. 5. Click through from Momondo.ca to whichever booking site is showing the cheap price. Important: When you get to the ITravel2000 search result page, you may want to click on 'All Nippon Airways - from $597' on the left-hand side. You may have noticed that Google Flights only shows dates up to about mid April 2017. And ITravel2000's calendar only allows you to select dates up to about this point as well. If you search for the same trip on FlightHub however, you'll find that you can book dates right up to about May 11, 2017. You do need to choose a departing date of April 27 or earlier though. So realistically, around April 27 (or earlier) to May 11, 2017 are the dates furthest into the future that you can book today. There are plenty of other date combinations you can try though. Focus on dates where you are departing on a Monday, Tuesday, Wednesday, or Thursday and returning on a Monday, Tuesday, Wednesday or Thursday. 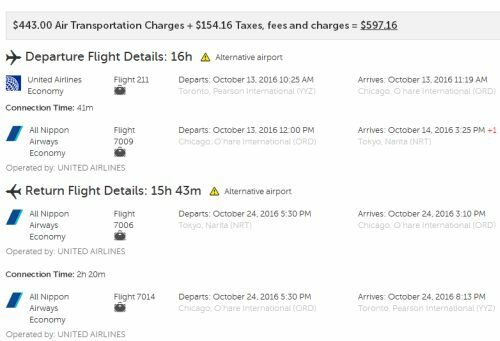 The availability for travel is from October 2016 to April 2017. 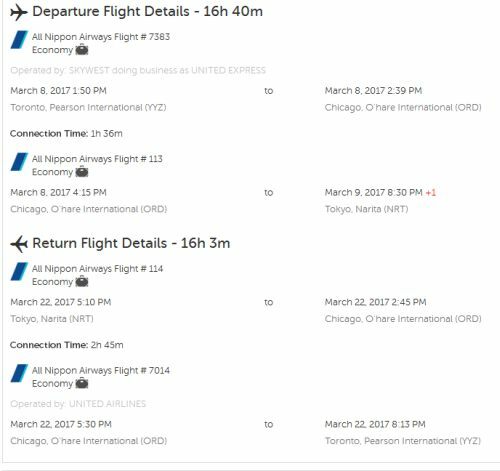 16 Responses to "Toronto to Tokyo, Japan - $597 CAD roundtrip including taxes | August 2016 through to April 2017 !" What's wrong with a flight being operated by United instead of Nippon Airways? I don't think there's anything wrong with it, but most people would just rather fly with ANA than United. Bummer direct flights (+baby) from Toronto are double the $600 return. Anonymous, would you be so kind as to share your flight information for $602 CAD? Booked Nov 9 - 22, with stop over in Chicago. Return is a 3 hour connection flight so a bit more time than some flights. Price is $602 per person with the $10 credit. Prices seem to have gone up. I was searching this afternoon and all the date combinations were coming up around the $600 mark. I waited a few hours for my girlfriend to get home to hammer out dates, but everything has gone to $1000+. I did manage to get Feb 13-March 1 for $630. I agree with Kevin. I was trying to book for 7 people but the prices increased. I was checking it during the day and I found the flights to be 630. I waited until I got home to book everything using my laptop and no luck. It's all $1000+. Hopefully it changes tomorrow morning. The more traffic and hits the site gets, the computer automatically adjust the price upwards. This happens after the Fort Mac fire. Booked for $601 on booking xpert...the ticket was never "ticketed", so no go! In the future I would book through a reputable / well known website. If anyone was overcharged $30 by Flight Network or Fly Far, I have heard reports that you can call them, and they will refund your $30 immediately. I got a great price for fall trip, one traveller for $697. One stop in Chicago. Very excited! This is my second success on this site. Thanks! Thus was such a great tip! We booked tix for march break 2017 and paid $609 each. Amazing! !